A veritable flood of super cheap, but decently spec'd Windows 8.1 tablets are hitting the Western market from Chinese brands you may well not have heard of. 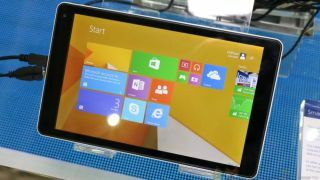 Microsoft and Intel promised that they would be coming and, indeed, affordable tablets are set to flood the market over the next few months. Forget about the current £200 (c$330, AU$ 360) range of Windows-based tablets from Acer or Dell, the new breed will cost as little as £100 ($160, AU$180). As was the case years ago for Android tablets, small Chinese brands are already pushing ahead with these low margin, tablet versions of the netbooks. A number of models are already on sale on the market for slightly more than £100. The Emdoor EM-i8080, Voyo A1 Mini, the Cube iWorks 8 and the Pipo W2 are just a few of the SKUs that we've identified. Like their netbook forefathers, they are built on quasi identical blueprints; a quad-core Intel BayTrail-T processor, the Z3735D, clocked at up to 1.8GHz, 2GB of RAM, 32GB onboard storage, an 8-inch display with a 1,280 x 800 pixel resolution, rear and front cameras, Bluetooth, microUSB, microSD and microHDMI by default and of course, Windows 8.1 plus Bing. The Z3735D that will end up powering the overwhelming majority of these products is fairly similar - performance wise - to the 1st generation Core 2 Duo U9400 that powered the awesome looking Dell Adamo 13 a few years ago. In other words, a very capable piece of kit that should run Windows 8.1 fairly well; what's surprising though is that you will not be able to get a similarly configured tablet running Android for less. That aggressive pricing leads us to believe that Intel may well have followed Microsoft's Windows strategy by heavily subsidising its cheapest processors, which in turns has allowed original equipment manufacturers (OEMs) to undercut even the cheapest Android tablets on the market.